The AIDA (Attention, Interest, Desire and Action) principle has been around in some shape or form since the late 19th century and is used to describe the decision making process we go through when purchasing an item. Whilst it has since been agreed that using four broad categories over simplifies the processes taking place, it still remains a helpful method for marketers to make sure they are covering all the bases. 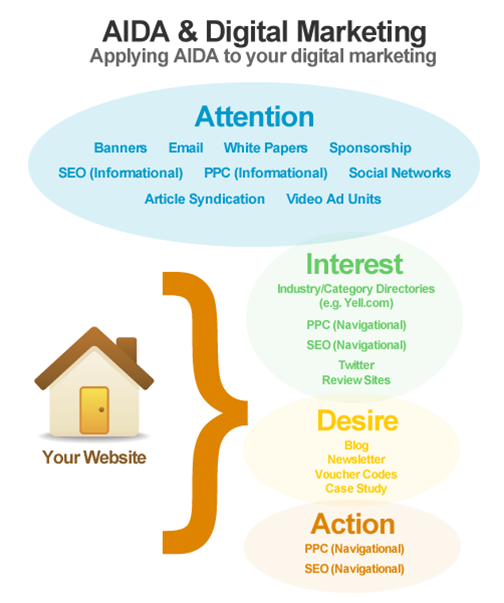 The diagram below shows how a wide reaching digital marketing strategy helps to catch consumers at each stage of the process. For the purposes of this diagram, your website is considered to be applicable to the final 3 steps (interest, desire and action). Wow.I haven’t heard of AIDA in a long time.Excellent post. I was flicking though some old course books I hadn’t looked at for at least 10 years or more and it all came flooding back. Got me thinking how these old ideas could be applied to online marketing, I think they stand the test of time quite well.